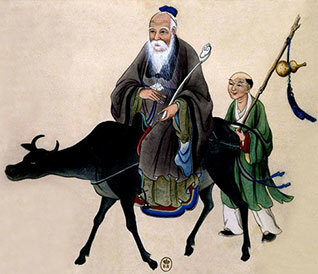 Chinese people, concerned with respect for rituals and traditions, attach great importance to the representation and staging of flowers or animals. Beyond their decorative aspect of great expressiveness, they have a traditional symbolic value, codified, evocative of power, financial success, matrimonial happiness, good health. 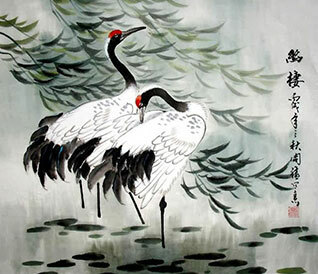 The drawings, paintings, engravings of animals and flowers among others, have beyond their decorative aspect, a symbolic value evocative of power, financial success, matrimonial happiness, good health. They are also given the capacity to ward off harmful influences such as demons and diseases. Thus introducing an object or a Chinese piece of furniture, is not insignificant for the followers of Feng Shui in particular. This aromatic plant hung above a door protects from disease. This plant is considered one of the "eight precious things". When these two animals appear together, they symbolize happiness. Often depicted with pines and wild cherry trees, bamboo is a symbol of longevity. He is one of the "three friends of winter". 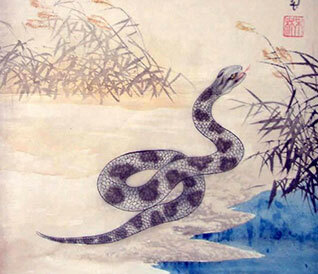 This creature, often feared in Western culture, is a symbol of good fortune in China. The five bats of happiness "Wu fu" represent five blessings, long life, wealth, health, love and natural death. 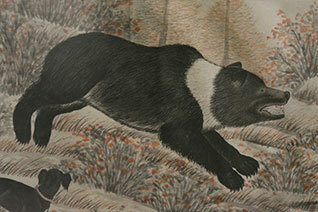 This strong and vigorous mammal usually symbolizes man. By nature, delicate, he is the messenger of good news. 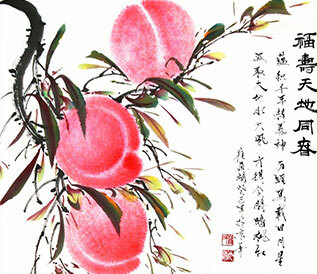 When some plum blossoms are associated with it, it means long life and beauty. When it's a cat, it augurs long life. This fish symbolizes good business. 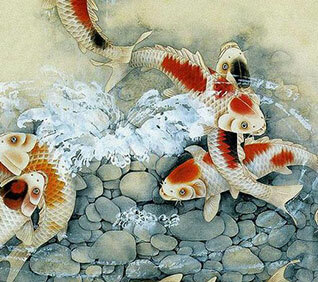 Sometimes carp is painted with a dragon. So, she illustrates an old Chinese saying, "carp jumping over the dragon's door" to symbolize a man with a high official position. The door of the dragon represents the door of the Court. Today this expression is used to congratulate or compliment someone who has talent and to wish them a better future. Because of its excellent visual acuity, the cat would be able to see spirits in the dark, thus he is able to drive out evil spirits. The cat is also, in China, the protector of silkworms. 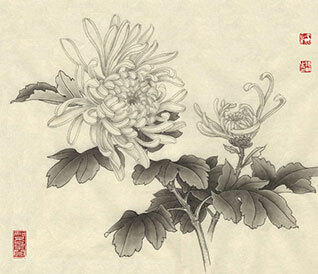 Emblem of joy, the Chrysanthemum is symbol of long life or duration, this flower represents autumn, one of the four seasons in the same way as the plum flower, the peony and the lotus flower. The cicada represents life after death or immortality. It protects from bad astral influences. They say that by singing at sunrise, he frightens ghosts. 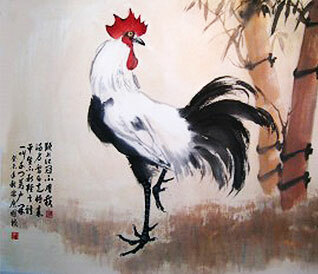 The rooster also represents achievement and fame. The crane is supposed to carry the souls of the dead to heaven. 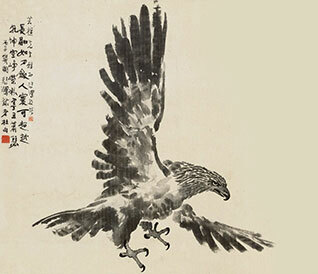 It is also a symbol of longevity and human wisdom. 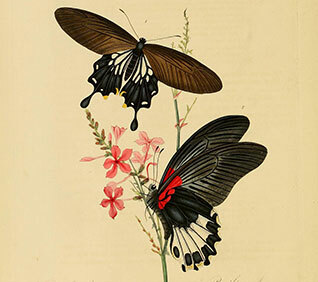 When depicted in flight, they symbolize an elevation in status. The little cricket symbolizes a fighting spirit. 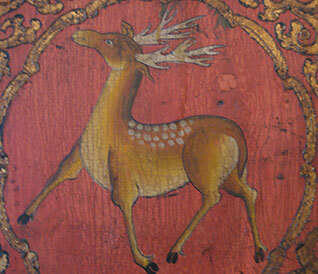 Symbol of longevity and prosperity, deer often accompany the God of longevity. In fact, the deer would be the only animal capable of finding the sacred fungus of immortality. The double bottle represents heaven and earth. As in the West, the dove is a symbol of peace. In China it legally represents loyalty and longevity. 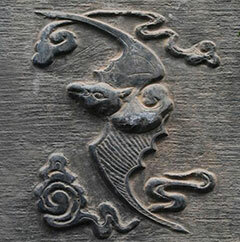 The emperors of the Han dynasty have as their emblem, two dragons fighting above a burning pearl. 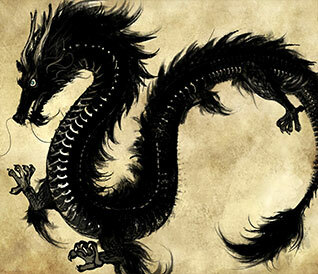 Under the Yuan and Ming, the representation of the dragon with five claws was reserved for the emperor. Some dragons of this period - probably stolen - were amputated of a claw in order to be sold with impunity. A dragon with four claws represents a prince, a dragon with three claws, a civil servant. 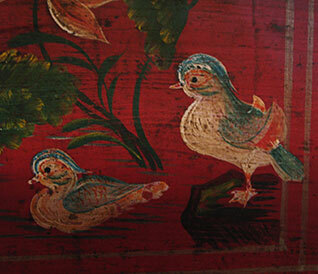 A couple of mandarin ducks swimming on a lake is a very popular motif on 14th century blue-white porcelain. Ducks are a symbol of marital fidelity. This powerful and majestic raptor represents strength. 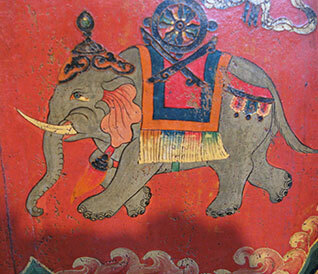 The elephant, with its impressive size, symbolizes a high moral level, strength and intelligence. 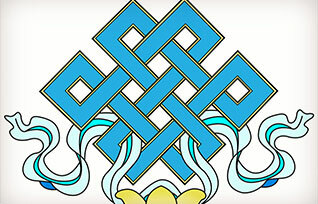 The endless knot represents a long life without setbacks. Fish are a symbol of wealth. 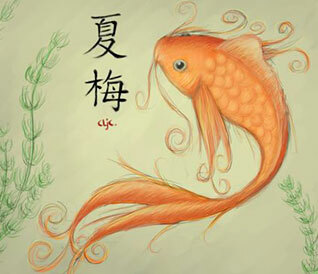 A pair of fish symbolizes happiness and marital fertility. The lumberjack, the peasant, the scholar and the fisherman represent the four trades that count. The geese symbolize a happy marriage. It represents speed and perseverance. 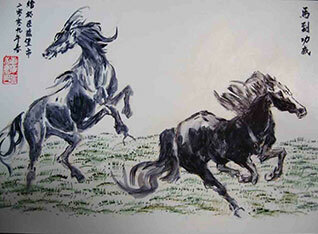 The legend of Ma Wang's eight horses is often used as a decorative motif. The king of animals is a symbol of superhuman strength. He is also the protector and messenger of holy beings. 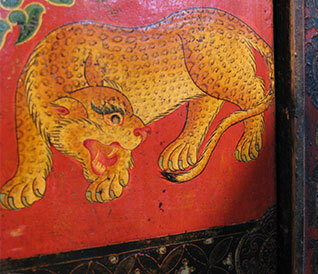 Lion and lioness, known as "Fu dogs", represent bravery and energy. The male lays his leg on an egg or ball representing the world or the law, while the female lays hers on her young, which often bites her tongue. 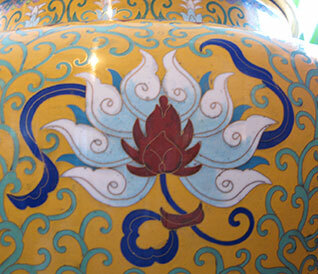 The lotus is the symbol of summer and productivity, one of the eight treasures of Buddhism. It represents purity and perfection. 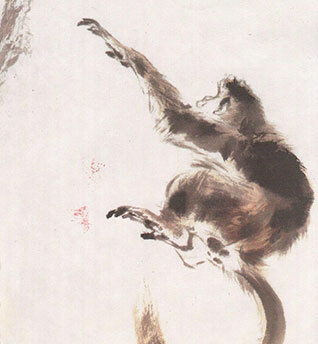 The monkey is often depicted holding a peach, the fruit that gives immortality, stolen from Xi-Wang-Mu's garden. Although capable of stealing the fruit, the monkey is a good creature and has the power to ward off evil spirits. This multi-layer vegetable represents skill. This animal represents the coming of spring. The panda is sometimes a symbol of man. The Chinese think that peach confers immortality, it is for the Taoists, the elixir of life. It is a symbol of marriage, spring, celebration and immortality. The peach tree of the gods flowers only once every 3000 years and the fruit of eternal life still takes 3000 years to mature. This spectacular bird is the emblem of beauty and dignity. 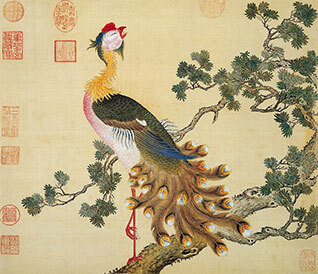 The coloured feathers of the peacock's tail were reserved for civil servants as early as the Ming dynasty, which allowed them to state their status. The pearl would be the solid essence of the moon. It is also used to represent beauty and purity. 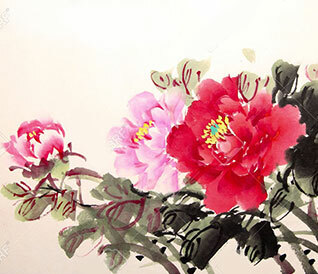 It's the queen of flowers, harbinger of good fortune and return of spring. Emblem of love and affection, it is also a symbol of feminine beauty. The pheasant was used as an imperial symbol of authority and function. The Phoenix, emblem of the Empress and beauty, appears only in times of peace and prosperity. It ranks second among supernatural creatures, behind the dragon but before the unicorn and turtle. A group of small birds is always on duty when the Phoenix flies. This fruit symbolizes fertility and the many male ancestors. Because of its aggressive nature, quail symbolizes courage. 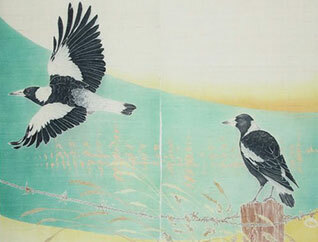 This animal sometimes symbolizes the male principle or the Yang. The serpent represents the supernatural powers, evil and evil, sometimes used to represent the woman. This creature exists only on the moon, which swallows it during the eclipse. 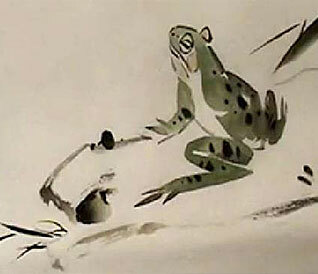 It is said that the immortal Liu Hai had a toad with 3 legs, symbol of the inaccessible. The tiger represents military strength and power. Its long length predisposes it to represent longevity and immortality. This graceful tree is a Buddhist symbol of humility. Spring sign, he would have the power to drive out demons.